NZ On Air believes the media consumed by our tamariki should not only stimulate their imagination, but also help them to build and affirm their sense of self and cultural identity. It’s important that Kiwi children can watch and interact with characters with their own accents, colloquialisms and values. The platform is advertising free and contains mostly local content funded by NZ On Air, along with some hand-picked international titles so children can find a wide range of content in one place. From traditional linear style TV content to shorter webisodes, games and apps the content covers comedy and cartoons through to healthy cooking, outdoor adventures, science and a lot more. The site is guided by a child-centric Charter of Principles. It is managed by a team within TVNZ. It received start up funding from NZ On Air and receives ongoing operational funding ($777,000 in the 18/19 year) as well as new content 100% funded by NZ On Air. An overview of the genesis of HEIHEI and the mahi to get it to launch. This section gives you critical information about how HEIHEI came into being, its purpose, and the content framework that guides funding round assessments. Amie Mills / amie@nzonair.govt.nz / Responsible for oversight of HEIHEI at NZ On Air with a specific focus on industry partnerships. Anna Currie / anna@nzonair.govt.nz / Lead HEIHEI funding advisor at NZ On Air. Kate Saunders / kate.saunders@tvnz.co.nz / HEIHEI Manager. Responsible for review, feedback and approval of all HEIHEI commissioned content. Shelley Sweeney / shelley.sweeney@tvnz.co.nz / HEIHEI Curator. Responsible for platform content curation and key producer liaison for live projects. Nevak Rogers /nevak.rogers@tvnz.co.nz/ Māori and Pasifika Commissioner at TVNZ and key point of content for projects with a strong Māori and Pasifika lens. Stacey Morrison shares the cultural framework underpinning HEIHEI and talks through examples of HEIHEI content that best embrace the kaupapa. This talk aims to help guide producers to think about how they can incorporate tikanga and te reo into stories. The team at TVNZ step us through the marketing campaign to launch HEIHEI, the audiences we’re targeting and what our media strategy is. They also share the creative approach and some of the campaign assets that have been created for the launch. This section is useful for anyone wanting to understand what the HEIHEI brand looks, feels and sounds like. Liz Busch provides in depth insights from the HEIHEI beta user testing sessions with families in Auckland, Whangarei and Christchurch. This talk contains useful findings about the HEIHEI target audiences of parents and tamariki; what they like about the platform, what content they care about and how they would use HEIHEI in their daily lives. Mark Russell outlines the work of the Asia NZ Foundation, the changing demographics of the New Zealand population, and how HEIHEI can better reach Asian communities in Aotearoa. Sean Lyons gives an overview of the work that Netsafe does and talks about potential content grants that creators can access for stories which reflect Netsafe values around keeping our tamariki safe online. Wendy Youens shares the work that ABLE does in the industry and how creators can cater to accessibility services in the content they create. TVNZ and NZ On Air share guidelines around 3rd party funding of HEIHEI content and talk about the upcoming August / September 2018 funding round in terms of the types of content (genres + topics) that the HEIHEI platform is looking for. This is the framework that will underpin the project. It outlines the principles and motivations for the project. It will support our content assessment and funding decisions, and feed into the overall strategy. Can older, pre-published content live on this platform? What is the balance of local vs foreign content? We do not have a set percentage in mind at this stage. We have said that the site will be “Proudly New Zealand”, both in its look and feel, its values, and of course its content. International content will be carefully selected to complement local. What about content from other platforms or media providers? We are keen to work with other platforms and providers wherever possible. This will not be a ring-fenced TVNZ-content platform and we will look to collaborate, integrate and embed content from multiple sources. A commitment from TVNZ is not required for projects that are for the platform only, or for content which is commissioned for another broadcaster or platform. How will proposals supported by a broadcaster other than TVNZ be treated? Proposals submitted to NZ On Air that are attached to a non-TVNZ broadcaster will be reviewed separately by NZ On Air and external assessors. What about Augmented Reality, Virtual Reality, Mixed Reality? MR and VR will are harder propositions to fund for HEIHEI as they’re not readily-accessible enough in New Zealand yet to reach a wide audience of children. The options for AR will be dependent on the technical / app solution used to deliver the experience and how that can easily integrate with this brand / platform. Please check out The Green Fairy on HEIHEI to see how this currently works. Does a series have to have an episodic structure like it does currently for broadcast? There is no fixed duration or number of episodes required for content on this platform. Will you fund native apps for smartphones and tablets? Yes, for the right idea we will. Will the site be bilingual? Not entirely. We aim to weave te reo through the content as much as possible and in some cases content may be primarily (or all) in te reo, but the site will not be fully bilingual. Please watch the video of Stacey Morrison talking through the HEIHEI pou to better understand what we are trying to achieve in this area. We will continue to grow and enhance this kaupapa. When submitting an application do we need to have an affiliated broadcast partner? If your application relates to content for the online platform only (and is asking for under $500k in production funding) then you do not need to have a broadcast partner. If you have secured a broadcast outcome, the broadcaster will be able to confirm the broadcast commitment within Eric (the online application system) if selected as your Primary Platform. If you have secured support from any other additional platform, please upload a letter of support from that platform. Applications made through Eric (the online application system) will be assessed by a panel made up of NZ On Air, TVNZ and external assessors. If you are not registered with Eric please register now. Once you're registered and logged in you'll have access to your dashboard, which will show all the open funding rounds, and any applications you have made or have in progress. For applications for the children's platform - select the Scripted & Factual funding round. 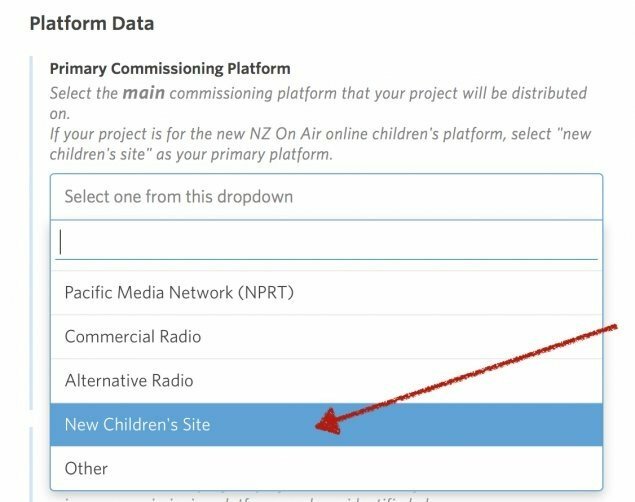 If the content is proposed for the platform only, select “New Children’s Site” as the primary commissioning platform, and all applications will be assessed by the panel. How will the assessment process work? NZ On Air will compile a long list of projects that clearly meet criteria. Long list sent to assessors. Short-listed proposals and assessment sheets to Content Advisory Panel assessors including Head of Funding at NZ On Air, GM Digital Content at TVNZ, and two external assessors. What’s the story with co-investment? Co-investment in production budgets remains a priority for NZ On Air where possible. There is no specific amount set: as usual, the amount and source of additional contributions to the production budget will be considered in the assessment of applications. There are tight sponsorship and co-investment guidelines however because this child-centred site will have a high standard of social responsibility. TVNZ’s Commercial and Sales teams may also be in a position to help producers. Please contact kate.saunders@tvnz.co.nz to discuss this further. What audience data will be available to producers to help them secure other investors in this new world? We will be transparent about analytics on the site. We aim to provide as much data as possible to producers regarding the use of, views and interaction with their content. For broadcast ratings, TVNZ will approach this as they currently do. Will $ be ring-fenced for this in the upcoming funding round? No. There is a stated priority for applications for this 5-9 year old audience that will be for the site, however there is no specifically ring-fenced fund just for this content. Will there be a development fund? There will not specifically be development funding for projects intended for the children’s platform. For higher budget productions, where multiple investors are likely to be involved, it may be possible to apply for development funding through the usual approach. Will the platform be recognised for the SPG? Initially probably not. However this will be an ongoing conversation and ultimately yes, we would hope it would qualify. As always, the producer owns IP in projects proposed by them. Does any content funded for children have to be on this platform now? The target audience for this platform is 5-9 year olds. We will prioritise projects that can feature on this platform in original or repurposed form. We expect any NZ On Air-funded content to be provided free online to the NZ public for at least a year, whether on an exclusive or nonexclusive basis. For HEIHEI, this should be longer. We may negotiate depending on the needs of other investors and genuine potential sales opportunities that the producer can outline. Exceptions will likely only be made for projects like broadcast children’s drama; namely for content with a shelf life, where other sales are anticipated, and other investors are involved. Producers should put a proposal to us. What if my content is intended for another platform? Unless NZ On Air is a minority investor we will expect such content to be made available to the platform in original or repurposed form within a month of first release. On a nonexclusive basis is fine. Producers should discuss this in their application. What are the mandatory rights required for this content distribution on this platform? We are asking for a minimum one-year non-exclusive right to distribute the content on this platform. This requirement may be extended beyond one-year depending on levels of investment from NZ On Air. We are still in the process of defining when that one-year window starts in terms of projects that have TV and online outcomes. Each project will be dealt with on a case-by-case basis if there are wider global distribution opportunities for content. Will you require exclusivity of content to the platform? The rights will be different for each project that is creating content for the platform. Exclusivity is unlikely to be a requirement, although there may be conversations around windowing for higher budget productions. How do we handle music licensing and rights - is this any different to television? Music licensing should be approached in the same way as you do for television. Make sure you secure online rights for at least NZ for as long as possible. How will the contracting for funded projects work? NZ On Air will contract for content for the children’s site on our standard terms and conditions. When funding is over $200,000 it is an equity investment. This means that we are entitled to a share of any income in accordance with our standard recoupment policy. A standard funding agreement is used (link). See Resources for Producers (link) on this website for guidance. Will the content on the platform be geo-blocked? Currently, all content on HEIHEI is geo-fenced to New Zealand. The purpose of the HEIHEI brand guide is to provide an understanding of the HEIHEI identity. To preserve the identity of the brand, please adhere to all guidelines specified in this document. The HEIHEI end resolve should be added to any piece of fully NZ On Air funded content made especially for HEIHEI, over 2 minutes long. It can be cut in with the end of the of the content piece so that the colours swipe across the end frame and the sound blends seamlessly. for design/brand checks before proceeding with the rest. Below are two HEIHEI/NZ On Air combined logo bugs to be used at the beginning of HEIHEI content. Our preference is for all content creators to use the pink version of the bug, however a black version is available in the case of the pink bug clashing with the content. In order to make HEIHEI the successful online community that we know it can be, samples of content from you would be great to help us continue to promote your shows. Check out the social media guidelines below for how to connect with HEIHEI on social media and what kind of requirements there are for content you provide.